Children are dogs, Teenagers are Cats. TRAVELING WITH KIDS---TO BEYOND AND BACK! Micah strolled into the house, tossed his backpack onto the floor and headed for the computer. He shrugged and squeezed by me into the kitchen. I watched him pull out an orange from the refrigerator and toss it from hand to hand as he glanced over other refrigerator contents. It wasn’t what I expected. I’d thought he’d be devastated. I’d even wondered if he’d cry. “I’m sorry you’re ineligible for wrestling this week,” I said. “I’ve got it figured.” He turned away from the refrigerator and slumped into a dining room chair. My mind raced. Jessica? Oh, please…not O.J. “A Simpson?” I asked. My head swam. I hadn’t taught my child to be a quitter. Who had? The answer was right in front of me. The culprit was a fat, yellow-skinned, beer-drinking cartoon character named Homer Simpson. I’m not silly enough to believe that banning the Simpson program and philosophy from my home will make Micah an achiever. Okay, maybe I am that silly, but I’m wrong. We didn’t force Micah to wrestle. He and his younger brother went out for Pee Wee wrestling when they came to live with us. They have wrestled every year since. 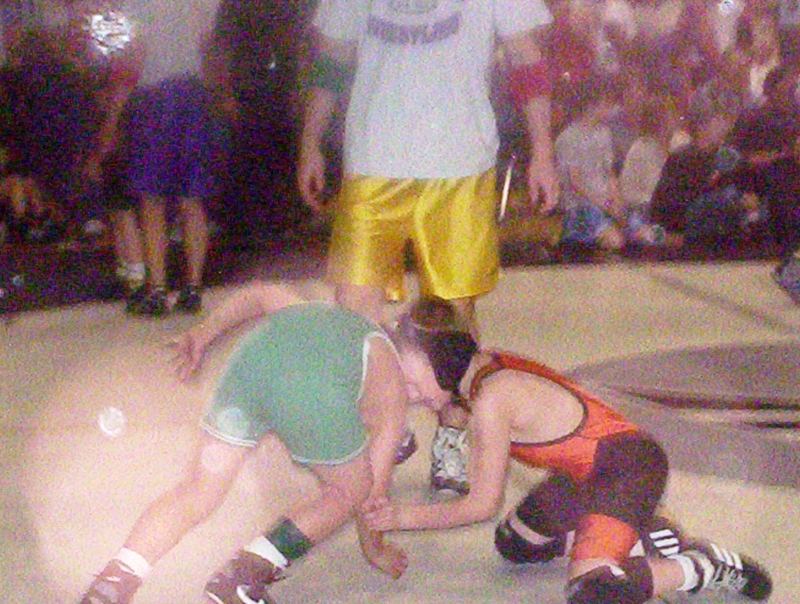 Micah also wrestled in junior high and high school. IT WAS HIS IDEA. So why doesn’t he care if he wins? Why is he satisfied with mostly passing grades? I was clueless. It would be easy to dismiss Micah’s motivational abyss as a result of his years in foster care, and that probably is a factor, but blaming the Simpsons or foster care is an easy out. And that would say volumes about MY motivational level. So I decided to research the problem of motivating kids…especially teens. Most authorities say the answer to low motivation in kids lies in their parenting. Now, before you pick up that rock to heave at me, let me say that we’re not talking about bad parenting here…just really targeted behavior modification. Judy Shepps Battle, in her article “Motivating the Underachiever” quoted a girl who had recently dropped out of high school. "If they give you the name, why not play the game? School gave up on me before I gave up on it." Battle says that sometimes the answer to low motivation in teens may be that the schools are using the wrong learning model. In other words, “different strokes for different folks.” Not all kids learn the same way. Some are visual learners, some auditory and some are hands-on. But, outside of accommodations made if a child has an IEP (individualized education profile or plan—which, incidentally, Micah has) schools do not tailor classroom learning to individual students. This is where parents can be effective. If Mom and Dad can find Billy’s passions and tie his school subjects into them at home, there might—just might—be a carry-over to the classroom. Recently, we took a foster child to the Hot Springs, South Dakota, to the mammoth digs there. He was enthralled. I wish we’d known ahead of time that you could sign up to help unearth and clean the fossils. What a motivator that would have been for this kid. He loves science…now, he has a connection and a direction. That can be a motivator. To do that job in the real world, he needs a college degree. But Micah’s chief passion is music. He wants to have a rock band and he’s tone deaf. Okay, so are most of today’s Scream-O and rap musicians. Still, not everybody can belong to “Underoath,” (arguably the most famous Screamo band, according to Micah.) Most musicians have some talent, an aptitude for music. So what do we do to tap into Micah’s passion? You have me there, Pal. Another website suggested that the biggest component of child motivation is their relationship with their parents. We’re doomed. This might come naturally to most biological children, but not for the kids we parent. “System” children have other issues. Micah has Reactive Attachment Disorder. He’s learning to trust and beginning to bond with us, but is that enough to motivate Micah to “win one for the Gipper?” Uh, no. But another source, “Changing Children’s Behavior,” by John and Helen Krumboltz, suggests teaching games and new skills to a child as a way to bond with children and teach them the desire to succeed. There’s a formula to this. First, you give the child an understanding of the game or skill. Second, you arrange for the child to succeed the first time or two that he tries the skill. (Yeah, you rig the game.) I can’t see my husband doing this well. He once tried to teach our biological son to play ping-pong. Chad could have walked away from the table and Charlie would still have been slamming that poor little ball against the wall. Third, you vary the success opportunities as he progresses. A friend of Krumboltz taught his son to play chess. After the child won a couple of games, the man won the next. The child was disappointed, and his father explained a strategy that might help him win the next time. Later, the father allowed his son to remove any of his father’s pieces that he wanted. At first, the boy took everything but eight pawns. Then, as his competence increased, he left more opposing pieces on the board. Finally, the father had to really apply himself to win. Another suggestion to bonding with your children is to do active things with them, especially teens. And involve other kids as well. Ask your child to go fishing or bowling or even paint-balling. Do it when he’s with his friends, one or more of them will probably want to go and peer pressure will force your little darling to tag along. He may give you “the look” all the time he’s rolling that heavy black ball down the alley, but he’ll probably have fun in spite of himself, and associate you with that good memory. That’s a lot of work for Beyonders. And it takes patience. But most of us Beyonders signed up to be parents, and those of us that just fell into the trap can use all the help we can get. Right? Another thing we can do to help motivate a child is to determine if he has the right tools to succeed. Micah has some difficulties that not every child has. He shows some signs of Oppositional Defiant Disorder. That means he is resistant to authority, no matter where it comes from. And teachers have authority. Another child might have ADHD or ADD. Or be dyslexic. Maybe this should have been point one. MAKE SURE YOUR CHILD HAS NO LEARNING DISABILITIES. So, if Mom or Dad never took their child to the optometrist, you take him. Check to see if he’s reversing letters when he reads. Find out if he needs counseling or therapy, and make sure he gets it. These things should have already been discovered by the schools, but if the child hasn’t been attending school regularly, or if he’s “slipped through the cracks,” as many foster children have, you may hold the key to his success. Another pundit on motivation suggests we not get directly involved with their homework (and so, their grades.) He says we should find out how much time the child should be spending on homework, and then tell him he must spend that amount in study. The rule of thumb is ten minutes per grade of school, so a first grader would spend ten minutes and a ninth grader would spend ninety. The child would have to show his assignment to you to make sure that he had put out some effort, but at the end of the assigned time, tell him to go and do something pleasurable. (As though you would have to encourage a teen to do this.) The next day, you make sure the assignment gets into the backpack, but that’s as far as you go. "I have two daughters, aged 16 and 13. The way that I motivate them is to be sure that they aren't allowed to watch TV, go online, talk on the phone or go out unless their chores (homework, piano practice, cleaning up) are done. I don't tell them they have to do these things; I just tell them that if they don't, they don't get to do the fun stuff. We have many a day where nothing gets done but it's not much of a fight around here anymore. I just have to remember that if they don't choose to do the chores, I can't nag them. I ask them to give me a half-hour a day to do whatever chores they choose. They really appreciated me allowing them to pick and choose what they do to help out; it gives them a sense of teamwork around the house. It certainly makes them realize that you are allowing them to be part of the adult team that runs that household." "Our son, almost 16, had been an honor roll student up until ninth grade. Now his grades are slipping. But we've learned with our older daughter that kids have to learn the importance of good grades on their own. The more pressure we put on him, the harder he digs his heels in. So I've finally decided that if he fails a class, he'll be the one taking it again, not me. No, I haven't given up on him, I can only show him the way. As parents we have to remember that, for the most part, they and we will live through this and be stronger people for it! Wouldn't it be boring to have kids that always did exactly what we wanted?" Few, if any sites or authors advocated complete loss of privileges for children who didn’t succeed. Why? The answer may be different for system kids than for our biological children. System kids have learned to adapt…and they are fatalistic. If their TV privileges are taken from them for an indefinite period, they simply think, “Poor me. I can never watch TV.” They don’t strive to win back the privilege. They replace it with another past-time. So immediate rewards may help with motivation. And, conversely, immediate negative sanctions. It’s the old carrot-and-stick thing. If they show you an “A” on a math paper (or a “C” or maybe even a “D”) have a party. Or give them a dollar. Or take them for ice cream. And, if you go onto the school parent website and see they have failed a test or haven’t turned in an assignment, take away TV for that night…and that night only. Of course, these strategies apply more to teenagers than elementary school kids. With younger children, it is more a matter of teaching them good habits and routines. With older children, I get the impression from the authorities on the subject that it is a matter of not allowing them to rebel. I mean, if you aren’t sitting across the table from them scowling until they dot every last “i.” they have nothing to rebel against. And if they fail a class, or have to go to school an extra year because they don’t have the credits to graduate, it was a logical consequence of THEIR CHOICES. Sometimes failure is a powerful motivator. I could use some help. If you have strategies that have worked for you to motivate kids to succeed, let me know. I could use some help here. Email me. Unless you are a short, fat yellow-skinned animated character named Simpson.